This little piggy went to market !! Sadly the item did not reach the reserve price, the auction lasted about 45 seconds, there were very limited bidders. Bidding started at £28.000 and the 4th bid was £38.000, so the hammer went down at £38.000. Earlier this year the Roman lead ingot or “PIG” was unearthed on a farm in Somerset. The dig was organised by the Southern Detectorist club, some other nice finds were made on the same day, such as Dan Stevenson’s Silver Roman Hoard. Jason Baker discovered the “very rare” find – known as a pig, and like most of us had no idea what it was. The two foot ingot dates back to 164 AD and is inscribed with the name of emperor Marcus Aurelius Armeniacus. Jason Baker had been searching with a faulty erratic search coil but had not replaced it, he said when his detector gave a loud sound I knew it was something good, “ I bet you did mate”. 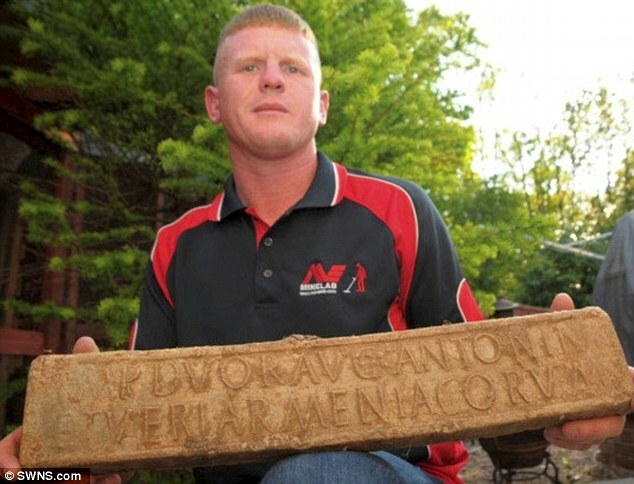 When the Romans invaded Britain 2,500 years ago, they mined the lead, cast it into big lead blocks and put the emperor’s name on it and sent it back to Rome. The ingot of Roman lead weighing six stone and two feet long is believed to be dated from around from 164 AD and is inscribed with the name of emperor Marcus Aurelius Armeniacus. We would like to wish Jason all the best for the future. Simply enter your E Mail address and subscribe you will then receive notifications when new posts are uploaded.